Ilya Repin painted this portrait of Leo Tolstoy in the act of writing. It's the unadorned space of a working farmer. There's a spade at the right, a wood-cutting saw and a scythe hanging on the back wall. The light streams in from the window. Instead of a fancy writing desk and chair, it's just a stool and a table. 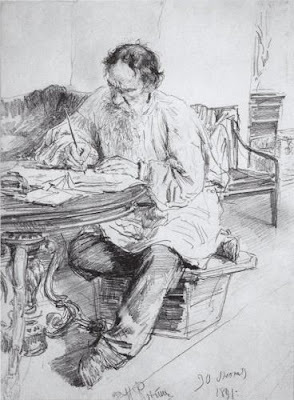 The message of the portrait is that Tolstoy (despite his aristocratic background) is really a hard-working writer who lived simply and close to the soil. Evidently, Repin did not find this composition readymade. He had to create it. An earlier study, probably from life, lacks the door at the left and the window at the right. A big chest of drawers attracts a lot of attention on the far right. This is the essence of composition. It's not just about where to place elements to make a pleasing arrangement. It's more about what to include and what to leave out; it's about how to attract the viewer's attention and thereby to engage their mind, in order to communicate the message you want to convey. The final painting reminds me of Albrecht Durer's Saint Jerome in His Study. The wider view suppresses small details and speaks more about Tolstoy in his space and broad themes about work, solitude, and the true definition of nobility. 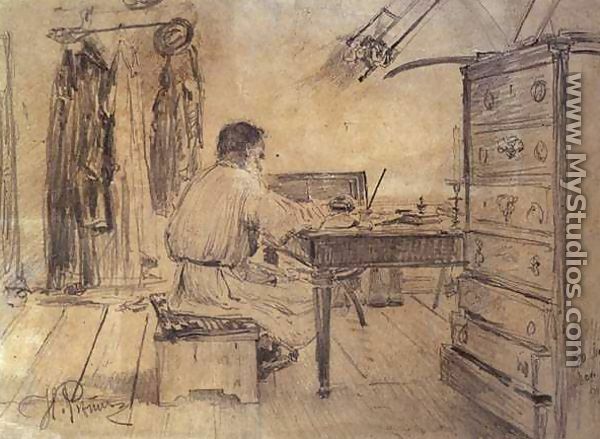 "You, Ilya Efimovitch, can not draw!" 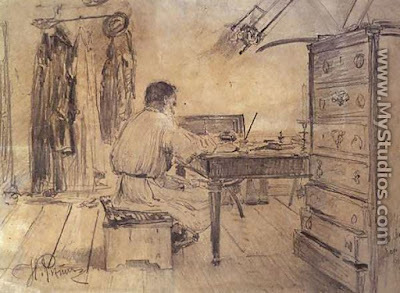 -Mikhail Vrubel to Repin at Abramtsevo. Mel, that's an intriguing quote. Can you give context? Why would Vrubel say that to Repin? 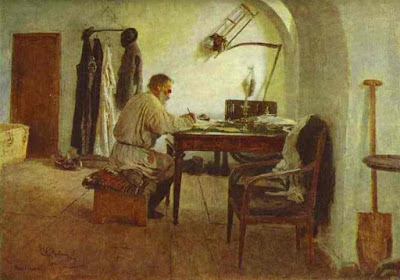 Robert, a quick Google search turned up a lot of photos of Tolstoy writing with his right hand. Jim, I agree that the final composition introduces ideas surrounding the writer and his work that the first drawing doesn't. Is it transcendence, mortality, the inner vs. the outer world? It's hard for me to verbalize them, but I feel they're there. Thanks for that interesting info, Mel. It's easy for us to forget the rivalries and feelings among artists from all those days past.